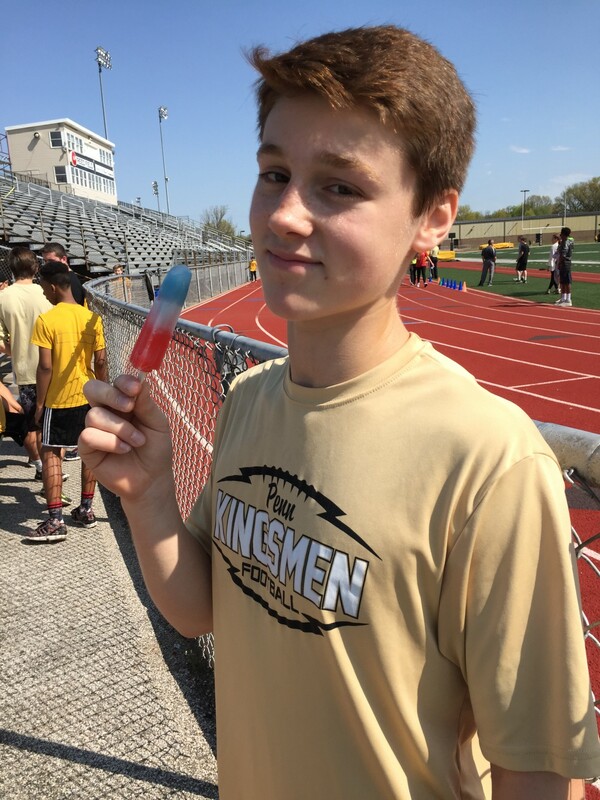 Drew Schneider enjoys a popsicle after running the Silver Mile. The Penn-Harris-Madison community will will be lining up on the Penn High School track on Saturday, May 7, for the annual Silver Mile event. The Silver Mile is the largest fund-raising event hosted by the P-H-M Education Foundation. With nearly 3,000 in attendance each year, the Silver Mile raises up to $90,000 to fund innovative teacher grants, distributed twice yearly to teachers and schools throughout the P-H-M system. The Silver Mile, celebrating its 11th year in 2016, has become the keystone community-gathering event for the families of the 10,000 students in the P-H-M schools and a great celebration of family health & fitness. The Run for Education events, — 5K run/walk, Fun Walk and Timed Mile Run — attract up to 800 participants annually who come for the run or walk and then stay to visit the morning’s festivities. In addition, the Silent Auction presents more than 75 items and has become a major attraction of the event with its unique bidding items that have raised up to $14,000 each year. Talent demonstrations by P-H-M groups, Penn Robotics demonstrations, Penn fine arts and Penn sports camp sign-ups are also features of the morning the keep the day festive. Penn’s ninth-graders get into the spirit of the event during classes the week prior to the Silver Mile. Pawlik said that Penn students train weeks in advance of the event, and focus on personal fitness goals, exercise routines, and nutrition. The top 50 boys and top 50 girls receive medals. Many students run the race as a “fun run” with their friends to enjoy the event. “For whatever reason the students choose (to run the event), it becomes a day of fun, community togetherness, and great fitness,” Pawlik said.